Mark and I went to investigate Cliffe Fort in Kent on Saturday, and whilst I was too much of a wimp to climb over the fence to get in (requiring walk over slippery wooden ‘gangplank’ and then a lumber over the metal pronged fence, with enough water on either side to get one thoroughly wet if falling in – highly likely for me given my lack of climbing prowess) so therefore missed seeing inside the fort, the wreck of the Dutch ship Hans Egede was enough for me. 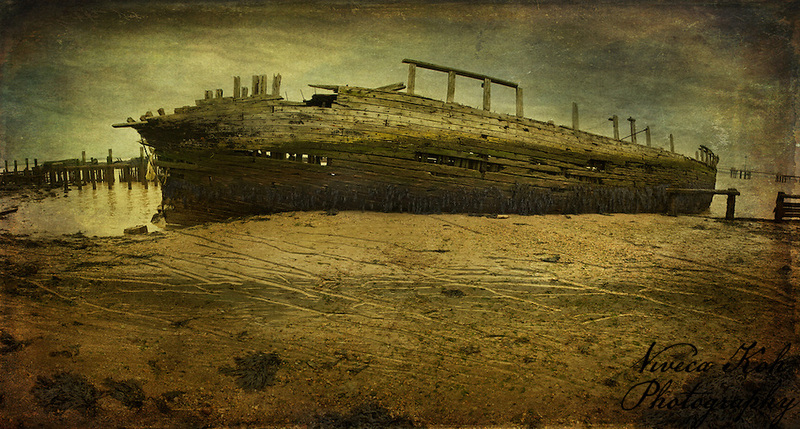 This wooden ship was built in 1922 and eventually beached at Cliffe during the 1960’s after sustaining fire damage and becoming structurally weakened, and has lain on the beach ever since, being battered by the tides and becoming increasingly more decrepit. This shot comprises of four separate portrait format photos stitched together in Photoshop CS3. As it was a Classic British winter day (bitingly cold wind and flat, dreary grey-white sky), I added an abstract sky texture later to counteract some of the flatness in that area, and then a further texture to give the panorama the ‘old-painting-in-need-of-restoration’ look that I was after, using layer masks to selectively remove or fade out both textures where I didn’t want them. It still wasn’t quite there though, but after a look through my textures database I settled on a photograph of rain blowing horizontally across a car windscreen, taken on a British “Summer” day in June – that just about did the trick! This entry was posted on Monday, January 24th, 2011 at 17:50. It is filed under Lectures & Projects, Textured Photographs and tagged with Fine Art, panorama, Photography, technique, Textures. You can follow any responses to this entry through the RSS 2.0 feed. Good stuff V! I agree with Mike on the composition and style! I really enjoy the use of texture and overall tone of the image. You’re giving me great new ideas. Great work.